Shenzhen MinDe electronics technology Ltd. (Mindeo) is located in Shenzhen High-tech Industrial Park and was initially founded in 2004. Mindeo is a prestigious high-tech company specializing in designing, developing and manufacturing barcode scan instruments including handheld barcode scanners, cordless barcode scanners, scan engines, image platform, lightweight data terminal, etc. The application domains are manufacturing, retailing, postage, logistic and medical services. Mindeo has set up a strong and stable R&D team, well-found services systems to deliver a wide variety of products. Mindeo has always been a reliable business partner for customers from most of the provinces of China and most of the countries in Europe and South East Asia. With over 10 years of experience in barcode scan technology industry area, Mindeo has achieved some important success by enormous effort. 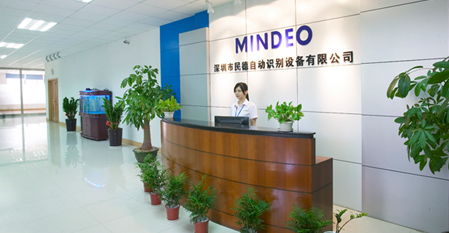 Mindeo has been qualified as "Software Company of Shenzhen", "Innovative and High-Tech Company of Shenzhen", and "National Innovative and High-Tech Company of China" in 2006, 2007 and 2009 respectively. Mindeo has successfully passed and well implemented the ISO9001:2008, ISO14001:2004 and OHSAS18001:2007. The product lines are certified by CE, FCC and RoHS etc. Mindeo sticks to "born to challenge" to deliver best products and services to our customers. Mindeo does the best to be your reliable business partner.